The Spring 2015 issue of Orlando Attractions Magazine is now available in print, on the Nook and in our iPhone and iPad apps. The cover story shows that the old view of the Chinese Theater has returned at Disney’s Hollywood Studios. Love it or hate it, the Sorcerer’s Hat has been removed. You’ll read a feature story on Magic Kingdom’s Tomorrowland. Find out the story behind all the details in “the future that never was” section of the park. We also have an excerpt from a new book entitled Universal vs. Disney by Sam Gennawey. Read all about the creation of Universal’s Islands of Adventure. We’ll also take a look at all of the Escape Game attractions popping up around Orlando, present a Q&A with Disney Historian Jim Korkis, find out about dining Italian style at Disney’s new Trattoria al Forno, staying at Disney’s BoardWalk Resort and see which 10 attractions Skipper Ben thinks are on the chopping block. • Feedback – Your best stories, photos and opinions. • Vacation Planner – Calendar of Orlando-area events. • Then & Now – Take a look back and see how things have changed. • Work In Progress – Information & photos from what’s in the works. • Versus – We put attractions head-to-head. • Photo Finds – Photo spread featuring Orlando’s latest and greatest. • Bemusement Park – Our original comic & games. • The Rumor Queue – What could possibly be next in Orlando? • Out of the Loop – Find out what’s happening in theme parks outside of Orlando. Click Here to order the print version. The current issue and all back issues are also available in our iPhone and iPad app. Click Here to download the free app. To purchase the Nook version of the magazine, either search for it on your Nook app or device, or Click Here to purchase it through Barnes & Noble’s website. You can also read the issue on your desktop or laptop computer through the Nook app for Mac or PC. The Nook app is also available for Android mobile phones. 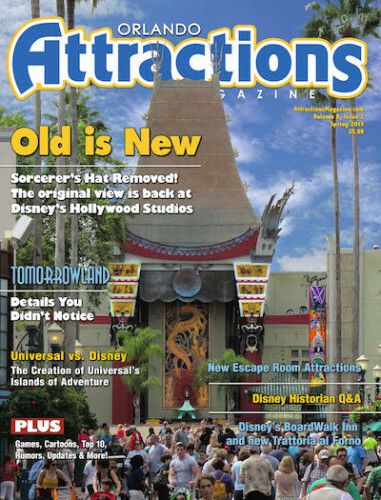 You can also find the latest issue at Theme Park Connection in Orlando, Fla. Print subscribers should receive their copy between now and April 20, 2015.